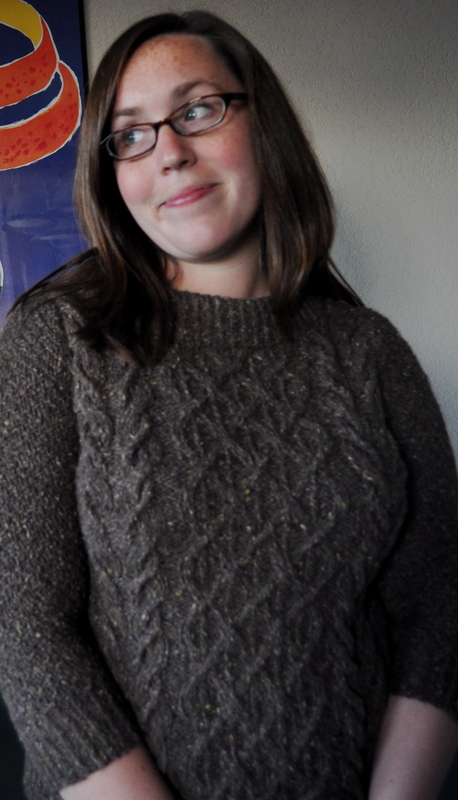 You may remember (but probably don’t) when I started a beautiful sweater years ago out of Berroco Ultra Alpaca. 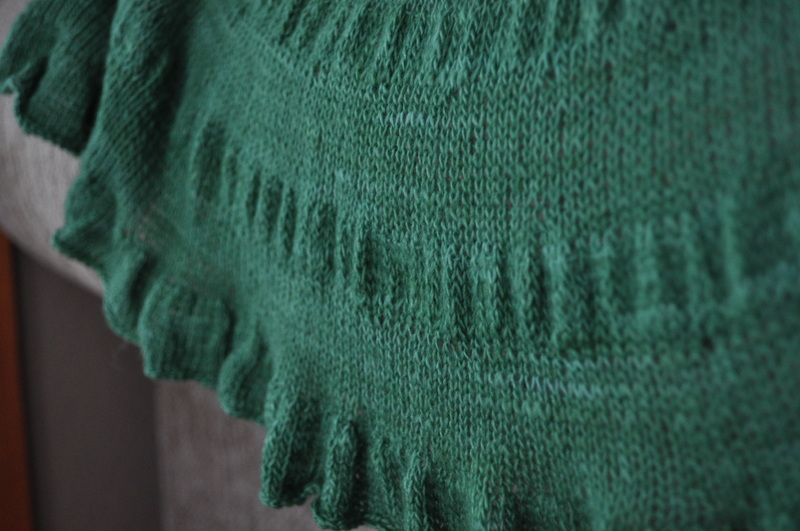 The pattern was Oblique by Véronik Avery from Knitty Fall 2007. I had some really cool buttons with an old coin design that I thought would look great since the buttons are so important for this pattern. Well, I finished the sweater! I love this pattern and think it makes a gorgeous sweater – the only problem for me is that the one I made was way too big! I decided to modify the pattern to be seamless instead of knitted flat, but my main problem is that the alpaca yarn stretched like crazy. The sleeves and body both ended up way too long (especially the sleeves . . .). I thought about ripping back and reknitting some of the sweater, but luckily I have a very tall friend and it just felt better to give it to her instead! Tada – instant Christmas present for Kristen! And it fits her perfectly! 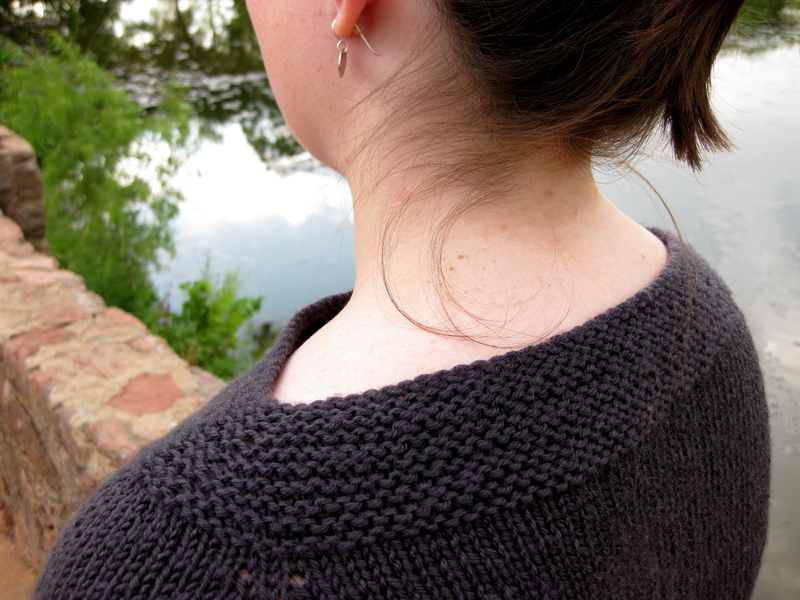 I’m definitely going to have to knit this again for myself (paying particular attention to sizing!) because I love this sweater and want to wear it. The pattern is very well written and really fun because of all of the stitch pattern changes. I also think the style is very flattering! Also known as My Favorite Sweater Ever! When I saw Norah Gaughan’s Beatnik in the new Knitty Deep Fall, I went to the yarn shop immediately after work to buy as much tweed as it would take for me to have. that. sweater. Luckily L&B had just received a shipment of Berroco Blackstone Tweed (I wanted to go with a woolly tweed instead of the Remix called for in the pattern) – it was spread out in the middle of the room, and I had my pick! Awesome! I came home with 10 balls of the Ancient Mariner (2603) color, and cast on for my swatch immediately. 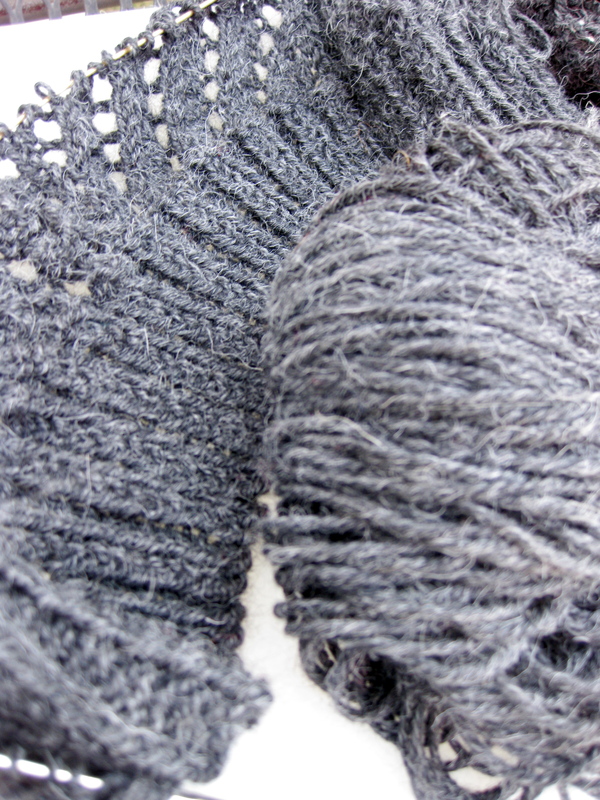 As is usually the case, I needed a much smaller needle than the yarn calls for – i.e. Blackstone Tweed calls for a US size 7 needle aaaaand I needed a US 3 to get gauge. Oh well, I’m getting used to it! : ) Also, I can only look off camera in one direction. I’m serious, stay tuned . . . 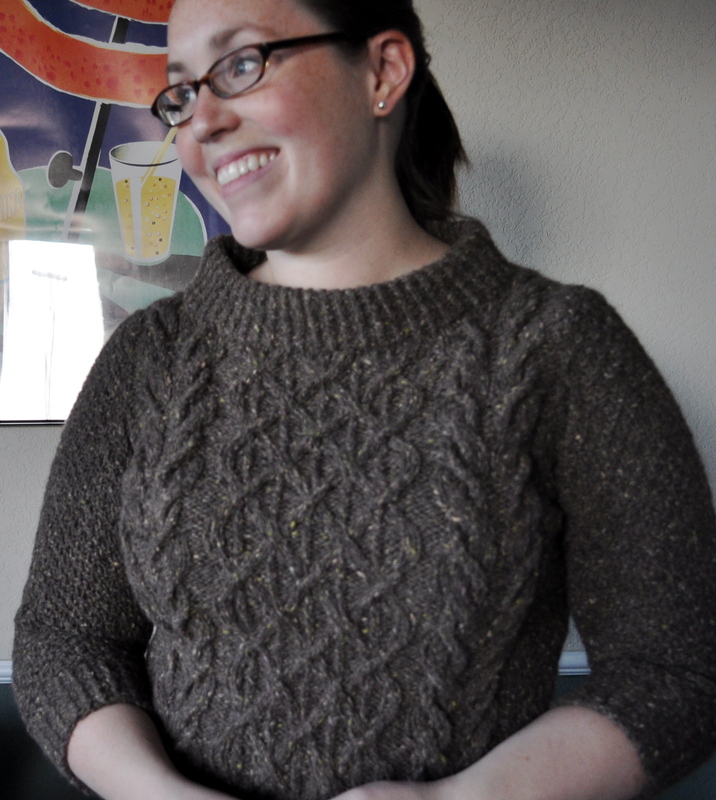 I decided to knit the sweater in the round and do seamless set in sleeves. Basically, I hate seaming so I don’t do it if it can be helped in any way. I knit the body in the round up to the armhole shaping, then worked the sleeves in the round up to the armhole shaping. On the sleeves and the body, I worked short rows instead of binding off stitches, then placed the stitches that would have been bound off on waste yarn to seam up later. Oh, and the armhole shaping for the sleeves and the body doesn’t match, so I used the shaping for the armhole for both (i.e. put the same number of stitches on waste yarn at the underarms and then decreased on the body as set out for the sleeve caps). After decreasing, I worked straight until [rows left to work on the body (excluding the shoulder shaping rows)] = [1/2 the number of sleeve sts]. 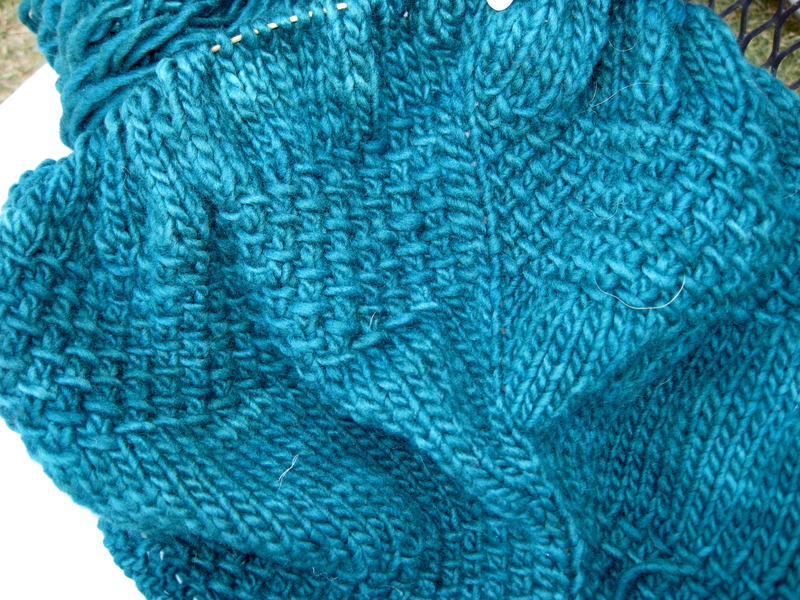 I worked short rows to shape the sleeve cap (based on the bind off directions from the pattern). At this point each piece (fronts and back) needed to be worked separately, with one stitch from the sleeve cap being consumed on every row of the body. After that, all I had to do was seam the shoulders (ok, there’s some seaming, but it’s minimal) and pick up the collar as in the pattern. Alright, that paragraph is long – I hope it makes some sense. I’m so happy with the result! 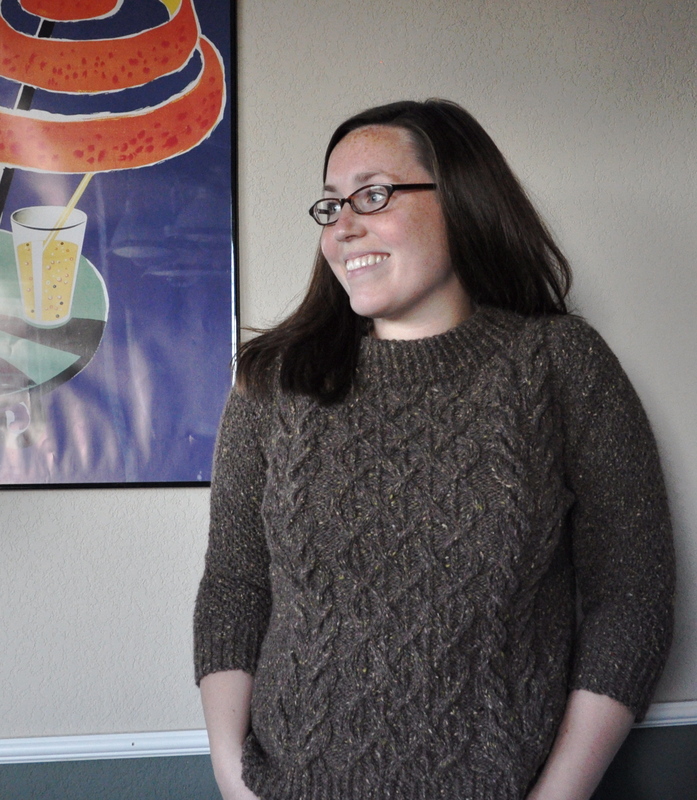 After blocking, my Beatnik fits perfectly and I love, love, love the stand-up, boatneck collar. Wearing it makes me feel very Mad Men! : ) Oh, and I was worried about having enough yarn (for my size, I would have needed 11 balls to meet the pattern yarn requirement), but I turned out to only need 8 plus a very tiny bit of the 9th ball of yarn. So now I’ve got some yarn left over to make a matching . . . something! Hmm . . . what would Joanie wear? 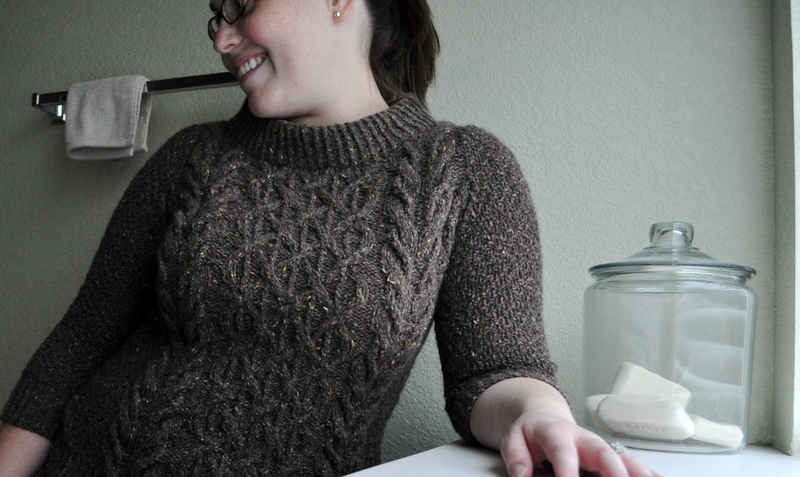 The new Knitty is out (the first ever First Fall!) 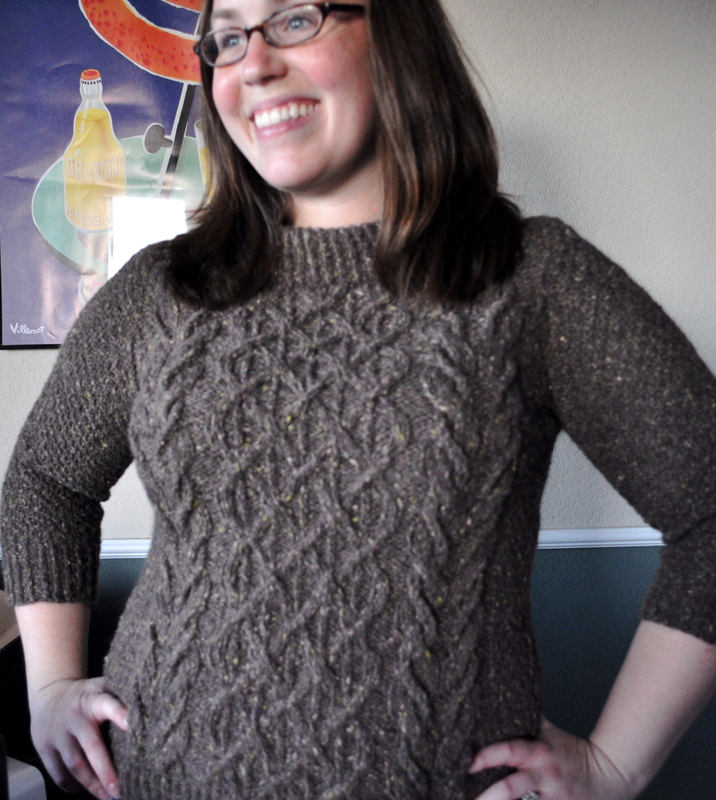 and my new pattern, Milly, is in it! Hooray! Here’s a lovely picture of Emily in Milly . . .
And to Sum it All Up . 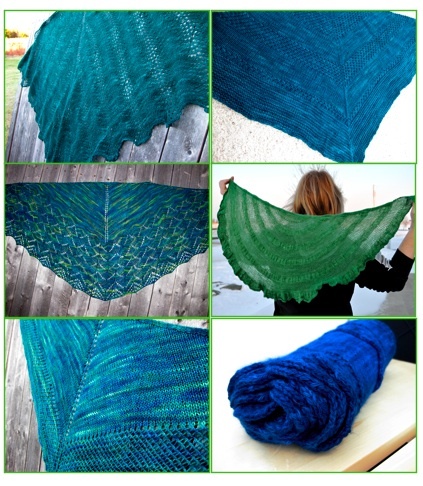 . .
You may have noticed an overarching theme to my knitting for the past few months – shawls, particularly, green shawls! To be completely honest, it started out as an unconscious trend, but soon even I couldn’t be completely oblivious to the overwhelming pile of emerald shawls I was accumulating. Before I was a knitter [so odd to think back to those days : )], I’m not sure the idea of wearing a shawl had ever crossed my mind. I knew that my mom had an old one that she had crocheted, but I never really considered that I might want to wrap one around my shoulders someday. Now I can definitely see the attraction – they use just the right [read: affordable] amount of delicious yarn, they take long enough and are large enough to feel like a substantial project, and they yield the opportunity to practice new stitch patterns and techniques. The variation in construction between different shawl patterns also contributes to the illusion that you might actually sometimes wear 28 different shawls, thus rationalizing more shawl knitting. Vicious. Cycle. Well, not so much a cycle as many straight lines that all lead to more shawls. 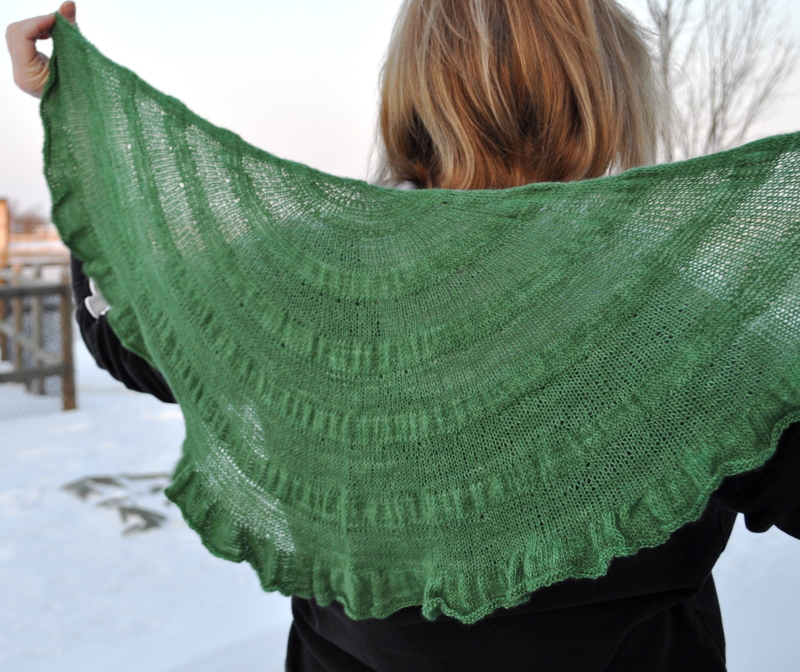 The final shawl in what I’ll be calling my “emerald period” [which I still consider myself to be in, and for which I see no end in sight] may be my favorite. 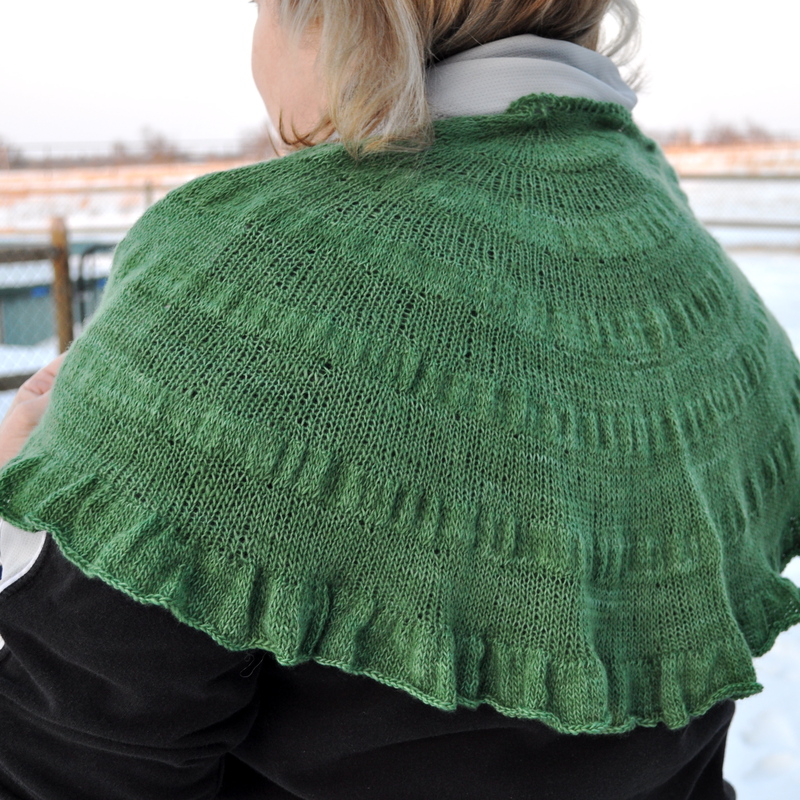 I cast on for it almost as soon as the Winter Knitty came out – Citron by Hillary Smith Callis. Luckily I had some Malabrigo Lace in Verde Adriana on hand [again, in order to be completely honest, since finishing this knit I now have more Malabrigo Lace on hand]. While I found the knitting a little bit tedious on this one [especially at 540 sts for the ruffle! ], I really, really love the finished product! I’ll definitely be knitting this again soon, with the aforementioned Malabrigo Lace! I would happily recommend this pattern for someone looking for a really soft, simple and adorable accessory. 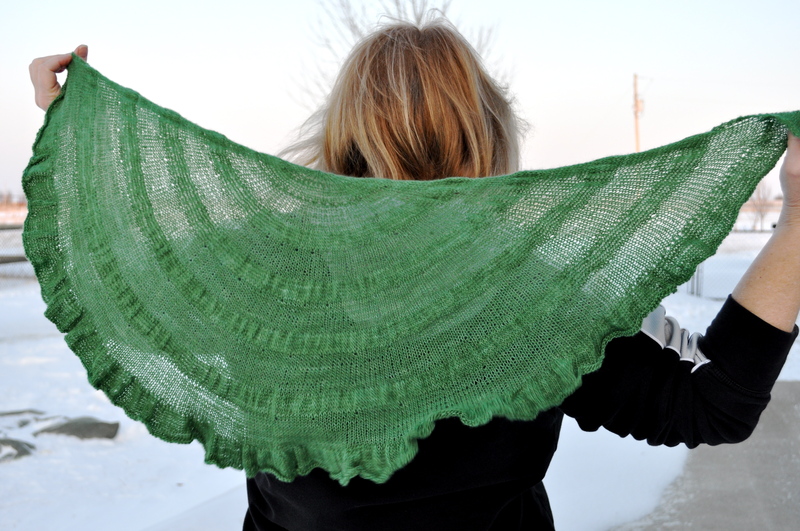 I just hope that the recipient [who looked adorable in the shawl, by the way], is continuing to wear it [just how I showed her – like all the cool knitters are wearing them! : )]. The new issue of Knitty (Fall 2009) is up and that means that I can finally, finally, finally reveal that my pattern, Margot, is in the issue! This is my first time going through the whole process, and I can tell you that I’m ecstatic to finally be able to share! Let me tell you about Margot – she’s a classic boatneck pullover, knit seamlessly from the top down. 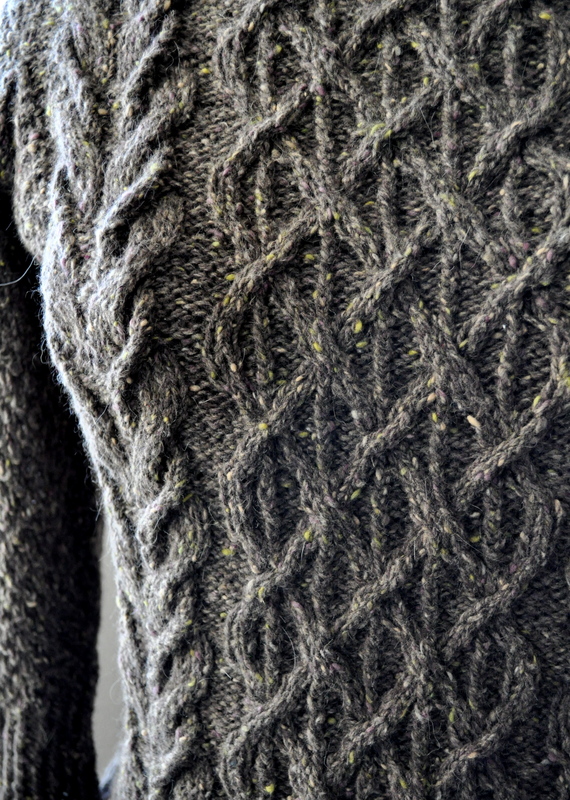 The body of the sweater is simple stockinette, with a garter stitch neckline, cuffs and waistband. Slight waist shaping and bracelet length sleeves with vents at the wrists give the sweater femininity, and the boatneck collar offers a flattering neckline. Margot was conceived as a simple sweater that you’d want to wear over and over again, and the top down design allows you to try on the in-progress piece to make sure you get the best fit. I hope you like knitting and wearing her as much as I did/do! 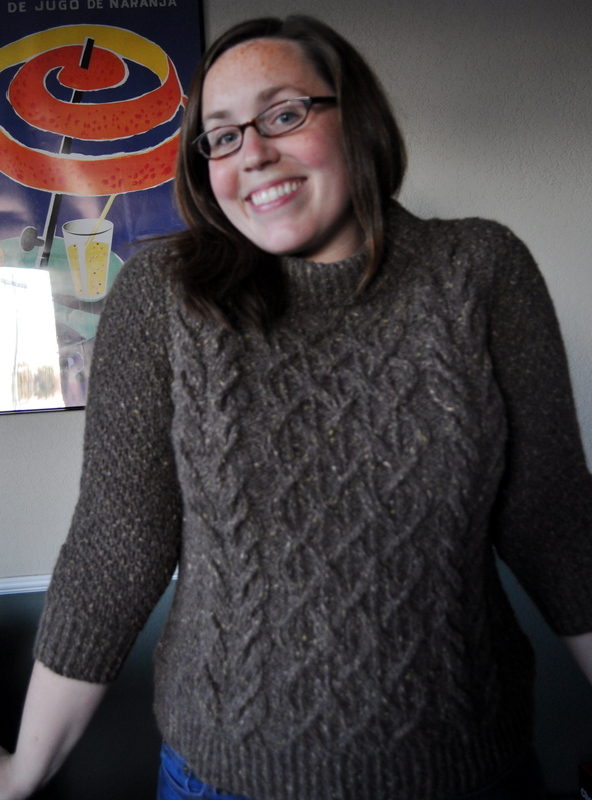 Of late, I’ve been in love with (obsessed with) the gorgeous over-sized cardigan Oblique from Fall 2007 Knitty. 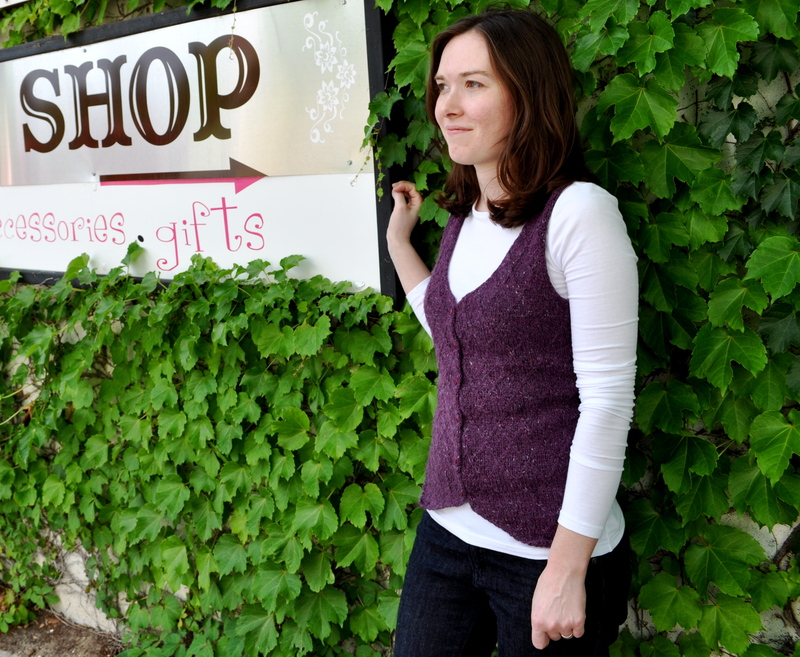 I love the different textures in the sweater, and I think the silhouette is very flattering. 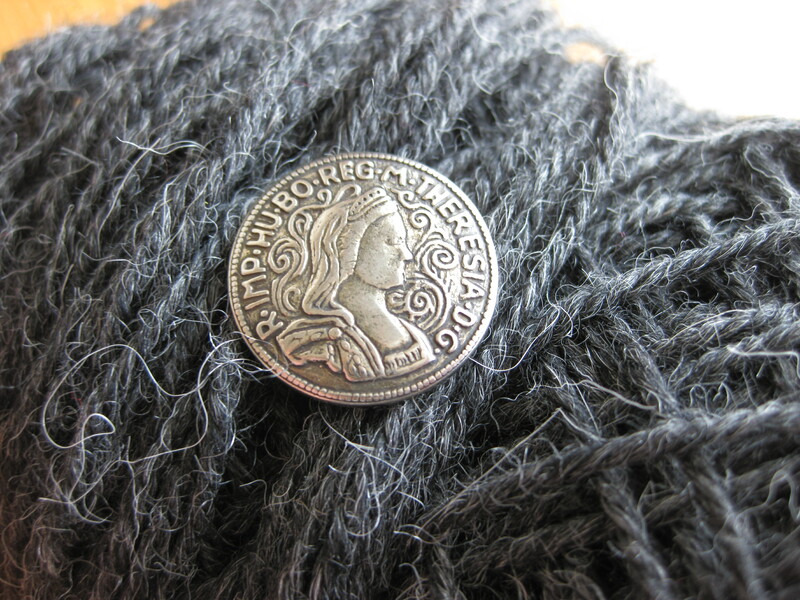 I hunted down the yarn I wanted for this sweater at L&B last week – Berroco Ultra Alpaca in Charcoal Mix. It’s beautiful yarn and I’m loving the result so far . . .
And now you see where my post title comes from? : ) I love love LOVE these buttons and I can’t wait to wear this sweater! In case you’re like me and want to know what inspired the buttons, you can either google R.IMP.HU.BO.REG.M.THERESIA.D.G. (like I did) or look at this site I found (by performing said google search) that makes me think the image and words are from a coin called a Maria Theresa Thaler, originally made by Austria and still struck in Turkey. Very cool! I’m also working on another textured shawl from Orlane’s Textured Shawl Recipe (ravelry link) out of Malabrigo in Verde Esperanza. One’s got to have a simple project that goes wherever you go!